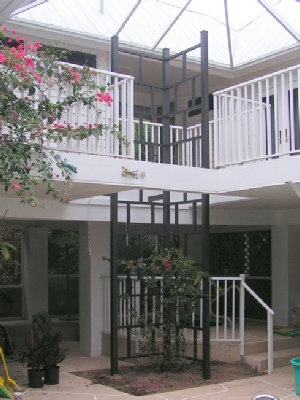 The ”running” pattern is unique to this strong, durable, lightweight and flexible use Trellis.It supports climbing roses against a wall, vines from an integrated planter or multiple small containers in the openings for a living wall effect. 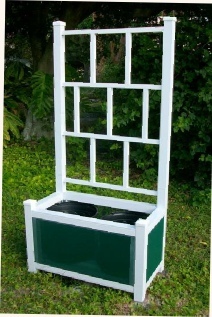 Mounting options are: feet buried into the ground or mounting brackets anchored to supporting materials. 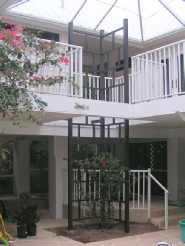 The mounting brackets can be attached to wood or concrete decks, stone or concrete blocks, or wood/aluminum post materials mounted on casters. 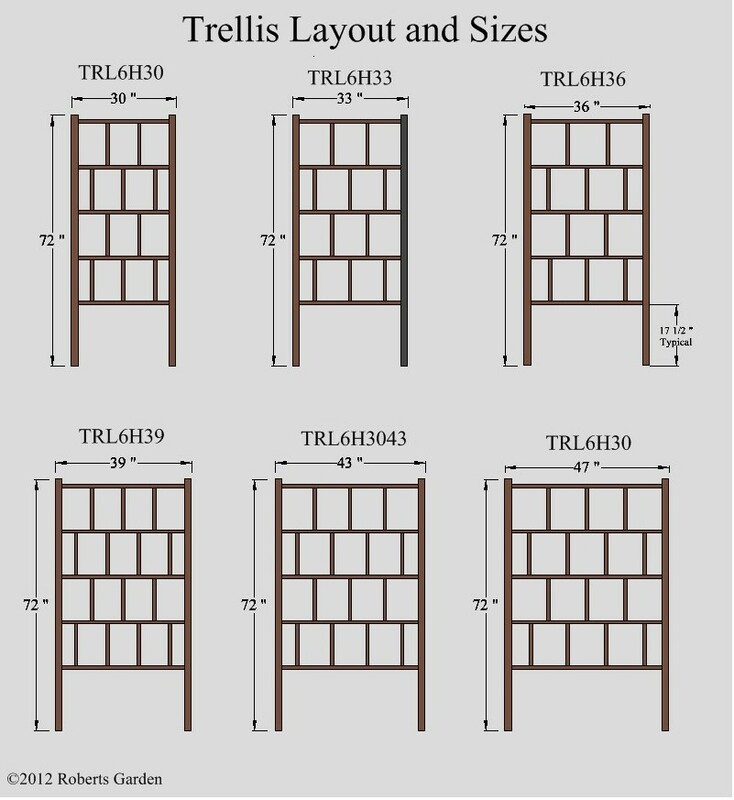 The pattern and number height of openings are the same for each size of Trellis. 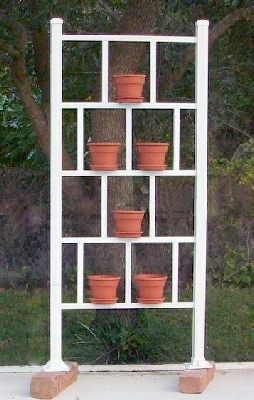 The widths of the openings vary with the overall width of the Trellis. The posts (verticals) are 2” square. The horizontals and the verticals making the patterns are 1” square. The standard Trellises are shipped partially assembled. 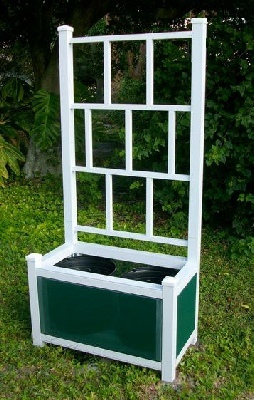 The interior of the Trellis comes in two pieces. The outside the posts and caps shipped loose. Assembly can be accomplished in less than 30 minutes, literally snapping the pieces together. No special tools necessary. The picture on the left shows a standard Trellis with six inch pots in the openings. The saucers were secured using pop rivets. We can supply a small bracket that fits over the supports to hold the saucer. The best way to do it is glue the saucer to the bracket and then put the bracket over the horizontal piece. Use a pot and saucer that locks together. Index of Sizes Layout (Drawn to Scale) Check these out to get a sense how the appearance changes with different sizes. For the adventurous check out the Golden Ratio. 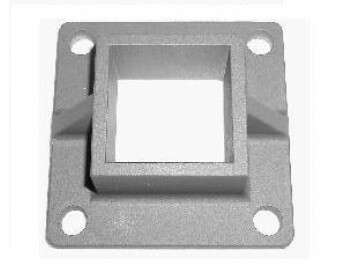 Deck Mount Castings: Proprietary aluminum castings used to support 2” square posts. Add $20. Ground Embed: The side posts are extended an additional 16”s. These posts can be embedded in dirt or concrete for stability, Add an additional $10. Saucer Brackets: Specially cut brackets to support container saucers. $1.50 each.